Wouldn't it be great if everyone entered their values for their NPP / Nodal Point / Entrance Pupil for lens and camera combinations. Some searching on the web will find a lot of people saying they want to start to create a database of some kind, but have not seen anything substantial so far (correct me if I am wrong). Please enter your own values if they are not listed. The first table shows the position of the tripod mount in relation to the lens axis. 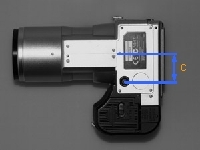 This is easy to measure and is dependent only on the camera body. The second table shows the actual entrance pupil distance which is only dependent on the lens itself. Note that the NPP for fisheye lenses is not constant over the image circle's FoV, so you will sometimes find different NPP values depending on the angle where your images overlap. The third table shows the number if pics neccessay for a full 360° coverage and the rotation angle between shots. Use as much as possible actual measurements rather than the reading on your panorama head, unless your are sure these are the same. To enter a line for your combination, edit the page by clicking edit at the top of the screen (you may need to create an account or sign-in first), and edit the table below. Use the correct name of your camera. For digital camera's, please use the name as mentioned at dpreview. Looking at the bottom of the camera, the distance between the middle of the tripod mount to the base of the lens base, or base for adaptor tube. 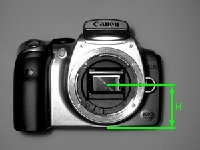 For fixed lens camera's which do not allow use of adaptors this column is not applicable. For lenses of the same manufacturer as the camera, just take the first table, simple. Several manufacturers (Sigma, Tamron, Tokina, etc) offer the same lens for a variety of camera mounts. 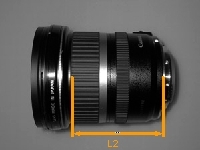 Since different camera manufacturers have different lens mount dimensions, these "third party" lenses are split in a separate table (below). Enter the exact lens name, or if you are using a camera with a fixed lens the name of your camera as mentioned at DPreview. Facing the side of the lens, the distance from the base of the lens to the Entrance Pupil. A negative value means the entrance pupil is outside the lens, in the camera body. Such is the case with many telephoto lenses. 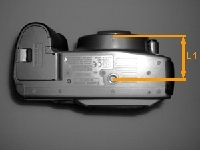 The lens base is the point on the lens that contacts the "lens base" on the camera used to determine the "Tripod mount length (L1)" in the table above. Canon 50mm f/2.5 macro 50mm 30mm at F11, focus at aprox 0.56m, 0.5m at left f16 mark. Nikkor AF-S 8-15mm f3.5-4.5E ED Fisheye 8mm > ~75 recommended. Varies: 67mm (0˚) (180˚ Circular image) see usual note on Fisheyes. Nikkor AF-S 8-15mm f3.5-4.5E ED Fisheye 15mm 70mm (0˚) (Full coverage on FX and DX) see usual note on Fisheyes. Nikkor AF-S 24-120mm f4G ED VR 24mm 71mm (<25˚) Varies. Several manufacturers (Sigma, Tamron, Tokina, etc) offer the same lens for a variety of camera mounts. 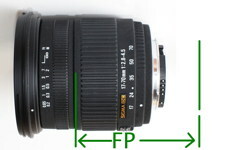 This is convenient for example, if the value listed for your lens is for the Canon version and you have a Nikon, you just have to add 2.5mm (46.5mm - 44mm). Unfortunately, many lenses in this table didn't specify the camera type. Please edit this table if you know the version of the lens actually measured. Luckily the difference between Nikon and Canon is just 2.5mm, so even if the version of the lens isn't known, the value listed should at least be reasonably close. Samyang 8mm f3.5 FISH-EYE CD. Data is taken from a variety of sources and personally verified by the editors wherever possible. Credit where credit is due! This page was last edited on 16 March 2019, at 18:53.